You can resize and rotate the venue. 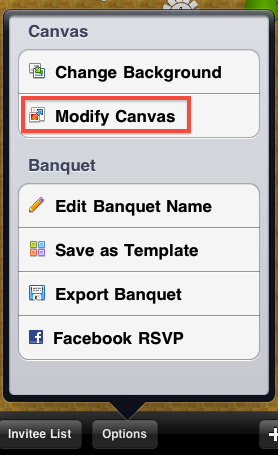 Just go to options and tap on 'Modify canvas'. You have three sizes to choose from: 660 x 1024, 990 x 1536 and 1320 x 2048. These are the equivalents of 1.0, 1.5, 2.0 times the size of the iPad screen. You should be able to pinch and zoom the venues. You can also rotate the venue between Portrait and Landscape. Some objects might be repositioned in order to fit them inside the page.